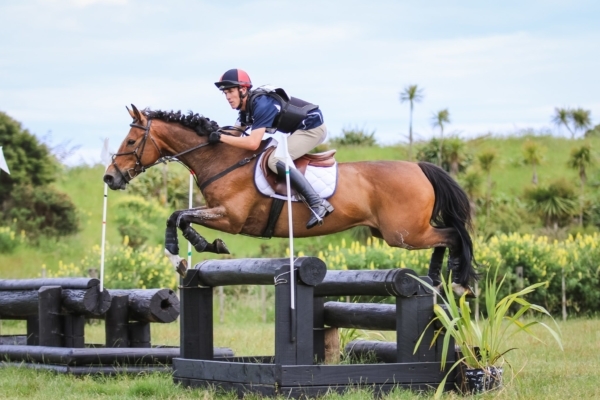 Eventing Wellington organisers were thrilled with both the quality and quantity of entries for their spring trial on 2 December at Queen Elizabeth Park. With Campbell Draper picking up the reins on course design for the first time, 120 entries overall were right up the mark. Particularly pleasing were six starters in the Woodlea Contracting CNC2* -(the most in years for this division), and multiple riders across the higher classes, including a group of very welcome South Island visitors, keen for a final hit out before Puhinui. The Woodlea 2* class provided a popular local victory for Aiden Viviers on his thoroughly genuine home-produced mare Giselle II, who just pipped Courtney Davis and By Hoki, with Corey Wood’s Pick Up Line third, local Tayla Mason fourth on Centennial, and Kate Fleming’s Mendelsshon fifth. In the other divisions, sponsored respectively by Dechra, Equest-Zoetis, Neeta Patch, Farmlands , Rural Trading Post, Virbac and Saddlery Warehouse, our well deserved winners were Georgie Moody, (How Fantastique), Charlotte Edwards (Charlton Chime), Sam Sebire (Oh Behave), Bria Fitzgerald (Rhapsody), Tracy McKee (KL Amorina), Bria Fitzgerald again (an outstanding effort to win again, this time with Midnight Ganador) and Paris Kari-Fields (Fox in Socks). We’re also incredibly grateful for supporting sponsors Pak n Save, Innovative Hospitality, FMG, Resene and our landowners, Greater Wellington Regional Council and the farm managers who juggle park visitors, farming and our competition needs. As well as the long established Zilco series for Horowhenua and Wellington area events, EW is very pleased to be part of the new $1000 series to be run over Wellington, Wairarapa and Central Districts competitions. We all hope this series prize will appeal to all levels and ages, with points rider based.